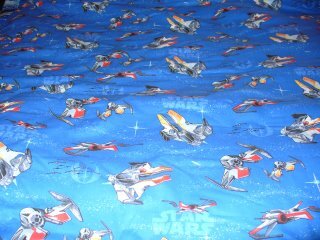 Here are pictures of the Quilt! 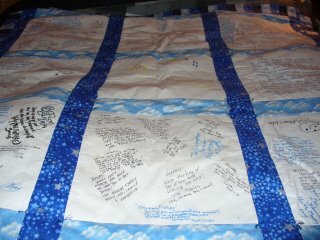 The quilt squares are filled with messages from friends and family that were written while I was in the hospital. I've tried many times to put these on the blog but it hasn't been working. I'll try to get more in the future. Including the new cat, who now sits on my lap when I wheel into the bedroom each night. He also has a habit of wanting attention when I'm on the floor to exercise. The exercises of death, also known as Pilates, focuses on abs constantly while working other muscles as well. The ones that focus solely on abs consist of laying on your back, legs in a table top position, arms stretched out, and then curling into a crunch using your abs to curl. Once curled, the arms are either stretched out past your knees or your hands are behind your head with elbows pointing out. You then pulse forward with your abs 15 times, then hold, then pulse your knees toward you with your lower abs 15 times, then hold, then pulse both 15 times, then hold. You then do the same thing all over again except doing crisscrosses or focusing on one side at a time. The next day you feel so sore you would actually welcome death. I get a similar feeling whenever I have to deal with the insurance company. I had to call them today. The actual process of walking with the prostheses is starting to feel natural enough that I don't think about each step anymore. This is a good thing but, when I'm not thinking about it, I have a habit of missing the motion that makes the knees bend. When that happens I always feel like I'm going to fall. I've caught myself everytime but it's getting dangerous. This is a big sign for me that it's time to get the permanent set of legs. Insurance needs to finish paying for the training wheels first. Of course, they are some pretty snazzy training wheels. They've paid for all but one knee joint. At least it gives me a chance to vent my frustrations over the phone. The insurance staff ultimately breaks down and tries to help. Hopefully I'll see some results soon. Once that is paid off we can start the process of getting C-legs. The c-legs will be my permanent legs. They have a microprocessor in them that controls the hydraulics in the knee. It reads how I'm moving my upper legs and swings the knee to match. They also have sensors that recognize uneven ground and my balance. The microprocessor makes changes to the hydraulics at a speed of 50 times per second. They'll give me added stability and, eventually, I should be able to lose one of the crutches permanently. That will help out tremendously at work. I've been trying to leave the wheelchair in the office as much as possible but frequently have to stay in the wheelchair because I'm carrying something in my lap. If I had a hand free I'd be more mobile. Two days a week has been good for me. Next week I'll be adding a third day. I've noticed a little bit of a drain in my energy level so it'll be interesting to see how this affects me. I know this has been long but I do want to comment on two TV shows I watch. Last week on Smallville, Clark was going crazy and Lex was a double amputee. He was yelling at Clark about how he had to spend his life in a wheelchair. He's Lex Luthor! He could have the most advanced pair of legs designed and built in a week! The other show was an episode of Stargate SG-1, (season 9 on DVD) in which one of the heroes was remembering seeing his dad for the first time after his fathers legs had been amputated. He was a young kid and his father made him feel like everything was going to be okay. After that it showed a memory of them together years later walking in a park. The father was using two crutches similar to mine and was leaning over just a little more dramatically than I do, but he seemed to be comfortable with the effort. Hopefully by the end of this year I'll be able to walk as comfortably with only one crutch. Hats off to SG-1 for being positive about amputees walking and giving me a visual of a goal. 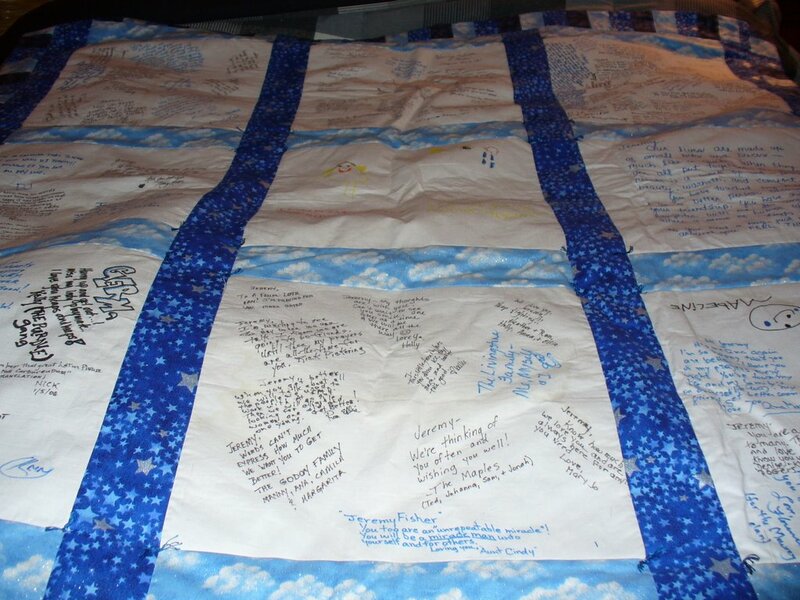 Jeremy, It's a beautiful quilt and I know it means a lot to you. Thank you for sharing it on your blog. It's also good to know what C-legs are and how they'll improve your movement. I can understand your frustration with the insurance company but we won't go there! Have a good day and a good week when you add that third day to your work week. Garh! Sea legs! Now, matey, you can be a pirate for real. I'm buying your a parrot for your birthday because this pun makes me way too happy. But seriously, the quilt is beautiful and I'm glad I got to see it. Good luck with the Pilates. Don't forget how important hydration is to muscle development and health. Drink water, Coke man! lots of kisses from the little grommet; did you get the photo? See even Kellie had to go there with the C-Legs. Did you get my message to the hotel, I need your email address. All this talk about "gadgets" makes me realize how far advanced our world has become...beam me up Scottie. I hope you have a great weekend and go Colts. Keep up the pilates, can't wait to see the abs. How about the buns of steel? Any progress? mshoe@hotmail.com - write me whenever. PS: Another favorite ab, sit down on the floor, c-legs perpendicular to the wall, abs sucked in, throw the basketball against the wall, straight in front of you to work one way, side to side to work obliques (sp?). Your choice which wall, I use one in my unfinished basement. Love all your kind words about our Cousin.